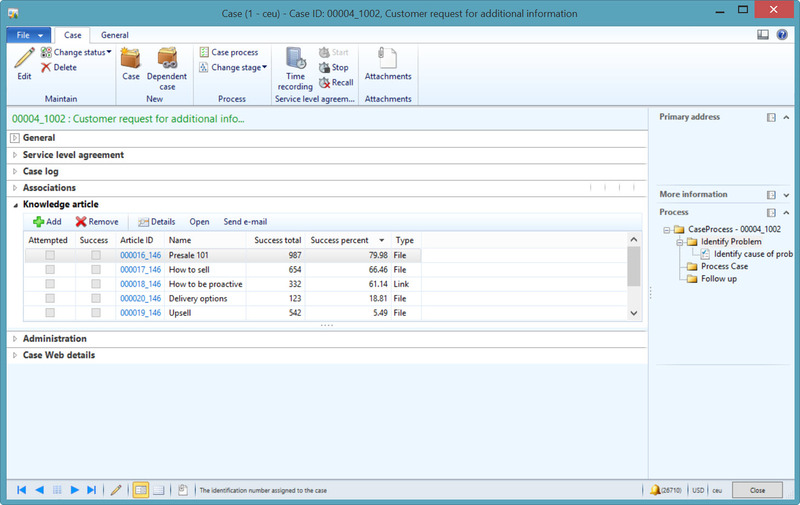 When we made the Case management feature set in the AX 2012 release we reused a number of existing functionality or design concepts already in place in other areas of AX. 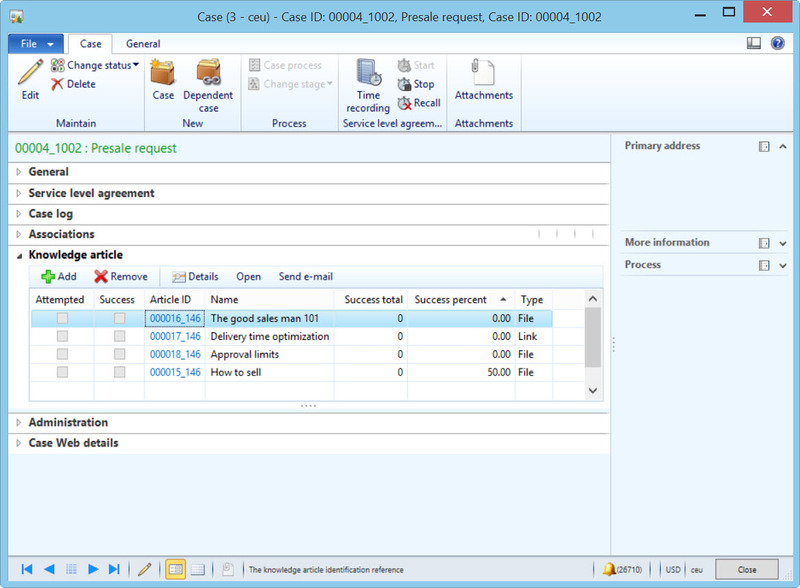 Some of the concepts we used to work with cases were: Service level agreements from the Service management module and Processes, transaction log, automatic activity generation, responsibilities and Encyclopedia from the Sales and marketing feature areas. Encyclopedia as it was called in AX2009 and before, and renamed to Knowledge articles in AX2012 is a bit of an odd bird. It was designed in 2000 as a “knowledge repository” for the sales and marketing department and introduced into AX with the Axapta 2.5 market pack. At the time there were thoughts about having multiple views both personal, unit and company specific views which unfortunately did not happen. In AX2012 we took a new look at the Encyclopedia and decided to reuse it together with cases calling it Knowledge articles, I think I had at the time read too many articles on Knowledge management which is the best explanation I can give for the rename. The key scenario at the time for Knowledge articles was the call between a Customer Service Representative (CSR) and a customer calling in with an issue. 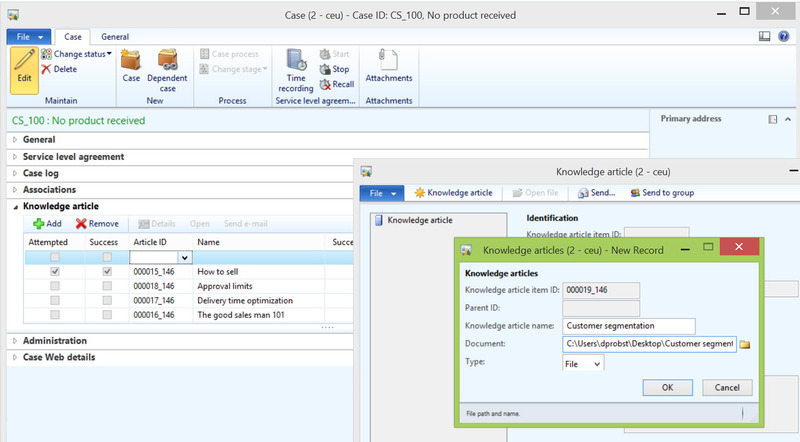 Combining that with a wish to accumulate structured knowledge into AX and we have the Knowledge article feature. 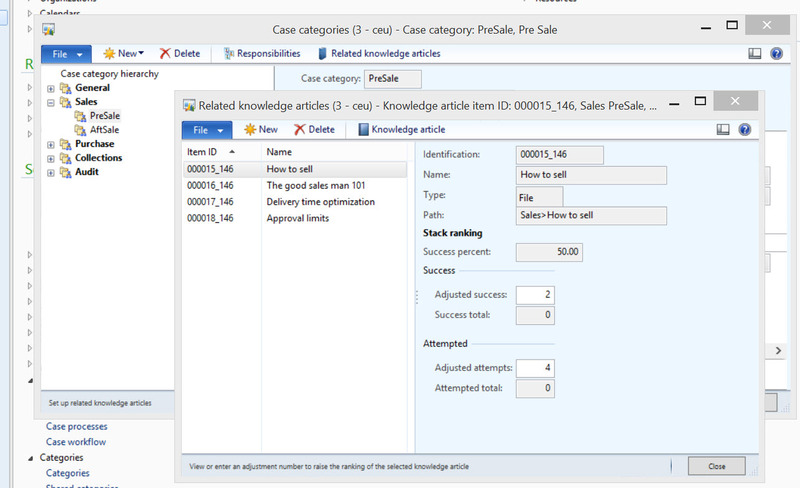 What the CSR should see in the Knowledge article tab of the Case details form is a set of relevant documents and links to the issue faced sorted so that the most useful articles are at the top. I made a little code change in the above picture regarding the Success total column and the sort order on Success percent. I have described that change in my end note. 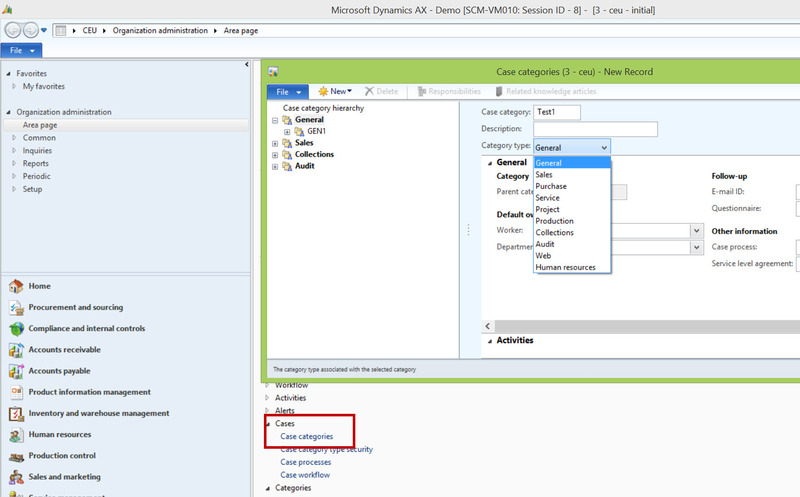 Let us attempt to create a set of Articles and make them accessible on a case of a given category. Start creating a few documents and URLs and place them into folders that make logical sense for you. Note that it is possible to drag’n’drop documents. 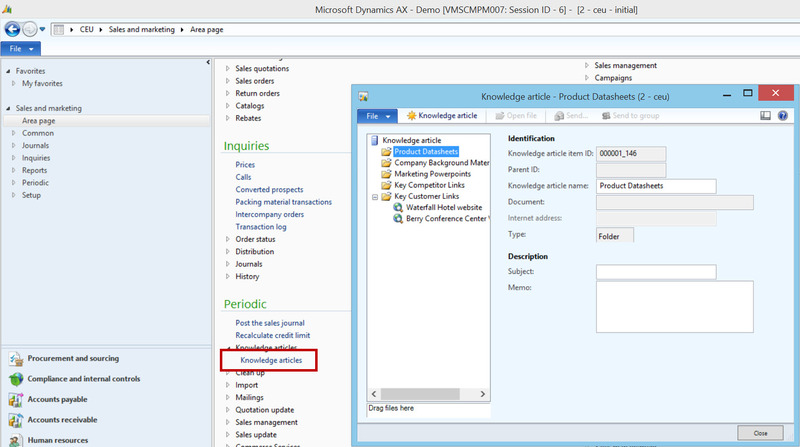 The folder structure will not impact the use of Knowledge articles in Cases it is solely for maintenance in the Knowledge articles form. 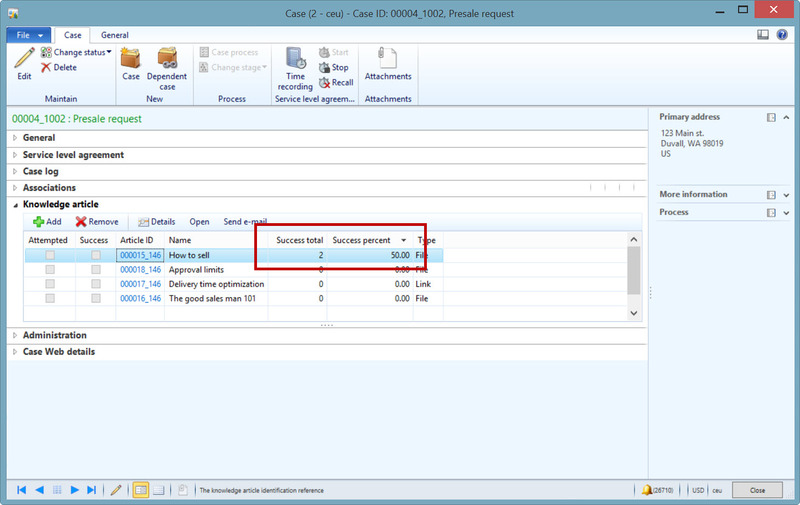 The above showed a scenario of the administrator adding documents which could potentially assist the frontline staff in successfully resolving cases. A second scenario which is more in line with the general Knowledge management philosophy of capturing knowledge from employees is that an employee add a note or document to a case regarding how he/she solved a particular case of a given category. Below I clicked Add, then right clicked in the Article ID field and selected View details and added a new Knowledge article by clicking Knowledge article button and are now in the middle of associating a document on my desktop to the knowledge article. 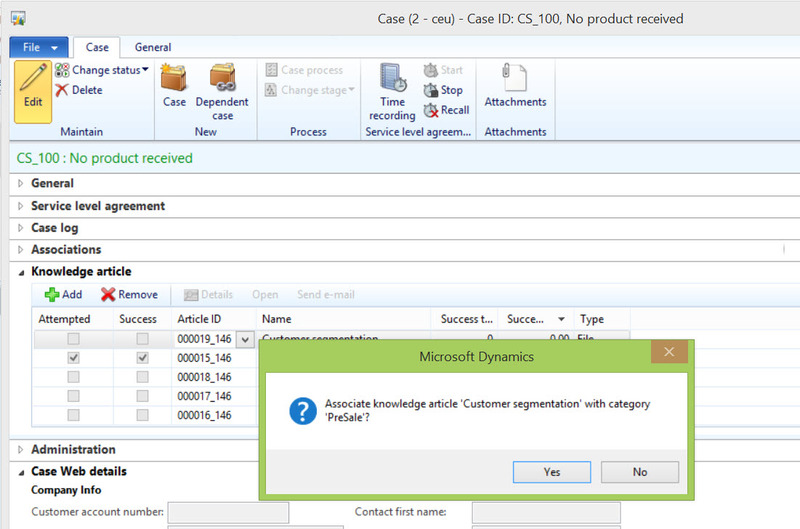 On replying Yes to this, future Cases of the same category will now have the “Customer segmentation” available. I would personally prefer that the success total column showed the number of “successes” (the check box) plus any success adjustment I may have made on the Case category relation and that the sorting would be with the most successful articles on top. Which gives the result I showed in the initial screenshot.